It was the dreaded moment for Bob Dylan, the private and reclusive bard of 1960s boomer rebels. In Eindhoven, Holland on February 17, 1993 during a concert Liz Souissi, a fan, appeared on stage to sing along with Bob Dylan. She was later dubbed Swiss Liz and she would not leave the mic until the song was over. At first Dylan seemed irritated but then joined in a duet with the musical fan. Swiss Liz was good enough for now. When security tried to remove her by the arm, Dylan pulled her back to the mic. He did that twice. Was it her talent, her red hair or her persistence? Or perhaps Dylan’s eye for a pretty girl who can hold a tune? At one point Bob Dylan offered her the guitar but she declined. Singing into Dylan’s eyes was all she wanted. As the song was winding down, Liz gave Dylan an affectionate hug and kiss and left. Dylan applauded her when he stopped playing. “At Bob’s concert in Eindhoven, 1993, a girl called Liz found her way on stage and sang a song with Bob. Swiss Liz is Liz Souissi from Switzerland, as you guess. 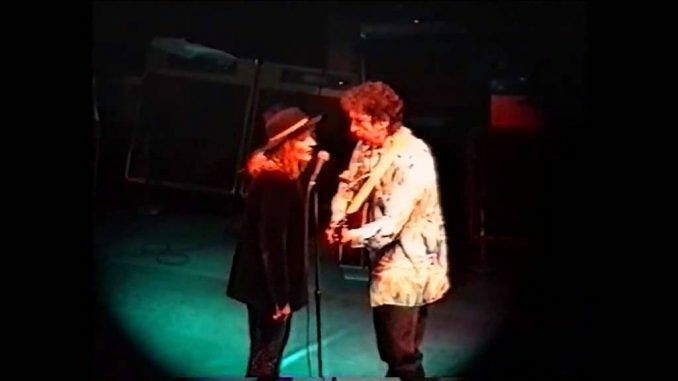 The performance she made her appearance on stage with Dylan was Eindhoven, 17th February 1993. There’s a double cd from this concert: Bob Dylan The Never Ending Tour featuring Liz Sioussi (Take It Or Leave It Music) (T-380)and a video clip showing a very friendly Dylan. Dylan shook his first surprise down and obviously enjoyed singing “The Times They Are A-Changin’” with her, smiling, applauding, fooling around, in spite of the body guards who were rather anguished by her appearance and tried to pull her away from Dylan who even held her by her arm to stay with him. Her singing was very good, taking even the lead part and pushing Dylan to give his best to make a fine duet.